Memorial . Etaples Military Cemetery I. A. 20. OH 1914 Vol 1 Reynolds, Captain D. (R.F.A. )* 164 Meanwhile, the German battalions were steadily gaining ground ; in fact, as the last gun team of the 5th Divisional Artillery was driving off, as described two paragraphs above, they were only four hundred yards from it, and were only kept back for a time by a party of the Manchesters, which, with the machine-gun detach- ment, offered so stout a resistance as to gain a few minutes' respite. During this brief interval, Captain Reynolds of the 37th Battery, having obtained permission to call for volunteers, came galloping down with teams to rescue the two howitzers which had been left on the ground. The German infantry was then within two hundred yards, yet by the gallantry and devotion of this little party both howitzers were limbered up ; and though one team was shot down before it could move, the other galloped off with its howitzer and brought it safely away. This episode, which gained the Victoria Cross for Captain Reynolds and for Drivers Luke and Drain, was the last gleam of light upon this gloomy corner of the field. 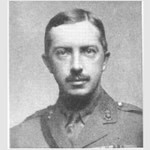 An extract from the London Gazette, Number 28976, dated 16th Nov., 1914, recording the award of V.C., reads:-At Le Cateau, on 26th Aug., he took up two teams and limbered up two guns under heavy Artillery and Infantry fire, and though the enemy was within 100 yards, he got one gun away safely. At Pisseloup, on 9th Sept., he reconnoitred at close range, discovered a battery which was holding up the advance and silenced it. He was severely wounded 15th Sept., 1914. The Essex Weekly News carried the following item early in 1915:- HOW DRAINE SAVED THE GUNS PERSONAL ACCOUNT OF GREAT BATTLE Interviewed by a representative of the Essex Weekly News, Driver Draine related how he went out with his battery and arrived in France on August 19. On August 23 they detrained at Le Cateau. Early on August 24 they went into action near Mons, and afterwards came the great retreat. Pressed to tell how he won the coveted distinction, he was at first unwilling to speak of himself. He then said: - We opened fire during the morning of Wednesday August 26th, coming into action on a big plain. There was no cover or hiding place whatever, so we had to get on with it the best way we could. There were 18 pounder batteries on either side of us, and there were hundreds of our Infantry going up to meet the enemy Siege batteries were in the rear of us. The Germans soon started shelling, and both sides were firing as hard as they could. It was now getting terrible. Shells came all ways in sixes and tens at the time. They were bursting all over the place - on the tops of our guns, and over our wagon lines, with plenty of spare rifle bullets flying about. Men and horses were getting wounded and killed. We received the order to get mounted. It was terrible. Shells were still bursting over the top of us. Other batteries were getting smashed to pieces. Lumps of shells and bullets were flying down in between us. We could not get anywhere for shelter, so we had to sit on our horses with our heads bent down between the animals. Most of our drivers got wounded and we had given up all hope of escape, and only waited for our turn at any moment to come. The shells burst like rain. Our Major, who was at the observing station, sent down the order that the 37th Battery would never retire. Our Captain then took control of the Battery. We stayed in action until we had lost nearly half our men, which was about 60 or 70, killed or wounded. The cries of the wounded and the shouting of the men was something terrible. I do not think there was a man on the field that day who did not say his Prayers. At last a general retirement was ordered. The 18 pounder Battery on the right of us went up to get their guns, but most of them were blown to pieces. Two teams only escaped, and they came down to our Battery, and our Captain claimed them to take two of our guns away. There were now four guns left in action and the question was what was to be done. The Captain sent down for wagon teams and gun limbers, and we made a dash for it. Only two teams reached the guns; they were F and B sub-sections. We managed to get two more guns away safely and took them to the nearest village. Then our Captain said, ?We must have more guns?, so F and B turned round and went back at a mad gallop. This time the German Infantry were only 100 yards off our guns. Driver Luke and myself went back at a mad pace, but Driver Cobey, my centre driver, was shot from his horse. There were then only left myself and Driver Luke, who was also awarded the VC, Captain Reynolds VC, Legion of Honour, who is now a Major in the Artillery, and two or three others. It was the worst time of my life. Shells and bullets were flying like rain from the clouds. This was my VC ride, and it was a ride of either life or death. I do not know how we managed to escape, but we saved two guns. Later, I and Driver Luke and Captain Reynolds were awarded the VC, and we were decorated on the field by the King at a place called Locon. His Majesty was accompanied by the Prince of Wales at the time. Husband of Mrs. Douglas Reynolds, of Clerkley Court, Leatherhead, Surrey. Actions in Spring 1916 covers a number of non specific actions on the Western Front in the period February to the end of June 1916. Much of this period concerned the build up to the Battle of the Somme, particularly the acclimatisation of the Service Battalions (Kitchener Volunteers) to trench routine. As the Battle of the Somme occupied the plans for 1916 no significant efforts were made in other sectors. Many of the casualties could be considered 'routine'. During the period December to June 1916 5845 British soldiers died in 'minor trench operations'.